Is The D-Train Back On Track? 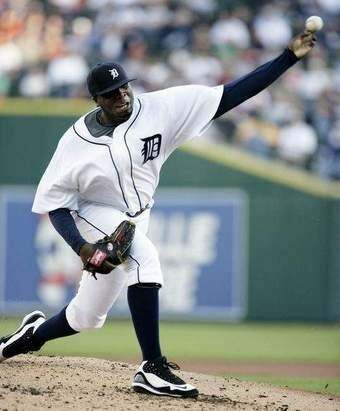 Dontrelle Willis won a game yesterday. And his pitching was more than adequate! So has he finally got over his case of the Greinkes or is this just a momentary blip on the mine cart ride to oblivion? This is Willis' second season in Detroit, but it was actually his first win ever as Tiger. And it was only in 2005 when Willis was one of the best pitchers in the game. Then injury problems became a mysterious "anxiety disorder" and everyone was pretty much ready to write him off. But now ... six innings of one-hit ball! Crank up the fireworks because the kid is back! Do you think it might be irresponsible to "reboot" his career so that we can all act like we did when he was a rookie, when every single thing he did stunned and amazed? That was way more fun than the last two years when he imploded and forgot how to throw a baseball. Maybe overzealous hype is just what the doctor ordered for a guy with confidence issues? It got Zack Greinke the cover of Sports Illustrated (eventually) so I definitely think it's worth trying again. "I'm a guy who shoots from the hip, and I was just playing bad. I have no condition. My condition is just going out and playing baseball and having fun." See? That doesn't ominous. Problem solved!